Attention deficit hyperactivity disorder (ADHD) affects around 1–3% of children. There is a high level of comorbidity with developmental and learning problems as well as with a variety of psychiatric disorders. ADHD is highly heritable, although there is no single causal risk factor and non-inherited factors also contribute to its aetiology. The genetic and environmental risk factors that have been implicated appear to be associated with a range of neurodevelopmental and neuropsychiatric outcomes, not just ADHD. The evidence to date suggests that both rare and multiple common genetic variants likely contribute to ADHD and modify its phenotype. ADHD or a similar phenotype also appears to be more common in extreme low birth weight and premature children and those exposed to exceptional early adversity. In this review, the authors consider recent developments in the understanding of risk factors that influence ADHD. Hyperkinetic disorder was first described as a syndrome in 1902 by George Still, a UK paediatrician. The disorder is characterised by developmentally inappropriate hyperactivity, inattention and impulsiveness. These symptoms must be of early onset, present in more than one setting and associated with impairment in functioning (eg, peer relationships, educational achievement). The current diagnostic terms of hyperkinetic disorder, used in the International Classification of Diseases, 10th revision (ICD-10) and attention deficit hyperactivity disorder (ADHD), adopted by the Diagnostic and statistical manual of mental disorders, fourth edition (DSM-IV) are similar but not identical (see table 1 for DSM-IV criteria). ICD-10 has more strict criteria, with a threshold number of symptoms in each of the domains of inattention, hyperactivity and impulsivity needed for diagnosis. Prevalence rates overall in the UK vary from 1.4% for hyperkinetic disorder1 to 2.23%2 for ADHD. Those with intellectual disability (ID) and boys (3–4:1 male:female ratio) are more commonly affected. ADHD, like other common medical and psychiatric disorders (eg, asthma, schizophrenia), is influenced by multiple genes, non-inherited factors and their interplay.5 There is no single cause of ADHD and exposure to a risk factor does not necessarily result in disorder. This means that any given risk factor will only be observed in a proportion of cases and will also be found in those who are unaffected. Also, risk factors that contribute to the origins of ADHD might not necessarily be the same as those that influence its course and outcomes. A further complexity is that genetic factors can exert indirect risk effects through interplay with environmental factors. Genes can alter sensitivity to environmental risks (gene–environment interaction), for example, environmental toxins or psychosocial adversity.6 Inherited factors can also influence the probability of exposure to certain environmental risks (gene–environment correlation; see later). This means that environmental and genetic risk effects cannot be considered as entirely distinct. There is robust evidence from a wide range of study designs of a strong inherited contribution to ADHD. Family studies have consistently found higher rates of ADHD (twofold to eightfold increased risk)7 in parents and siblings of affected probands compared with relatives of unaffected controls. Twin studies have shown that monozygotic twin pairs have much higher concordance rates for ADHD than dizygotic twin pairs8 and adoption studies have also found increased rates of ADHD in the biological parents of ADHD adoptees compared with both the adoptive parents of the probands and with the parents of controls without ADHD (eg, Sprich et al9). Mean heritability estimates are around 79%.10 However, heritability is not 100%, suggesting non-inherited factors also contribute. ADHD also appears to share an inherited liability with other neurodevelopmental and psychiatric problems, notably ASDs, developmental coordination problems,10 reading ability,11 IQ,12 conduct and mood problems.13 ,14 These findings suggest the same inherited and familial risks can result in the manifestation of different clinical phenotypes. The high heritability of ADHD has fuelled efforts to identify susceptibility genes. As is the case for other complex disorders, molecular genetic studies of ADHD have so far mainly been based on examining common DNA variation (the common disease–common variant hypothesis). This was originally investigated using candidate gene approaches, in which assumptions about the pathophysiology of the disorder are made, and more recently with ‘hypothesis-free’ genome wide association studies (GWAS), in which the frequencies of thousands of single nucleotide polymorphisms (SNPs) across the genome are compared between cases and controls.15 There is also emerging interest in the contribution of rare genetic variants to ADHD. There is a very large volume of literature on candidate genes reported to be associated with ADHD, but only a few have consistently withstood replication (table 2) and meta-analyses. The most robust evidence of association with ADHD has been shown for a dopamine D4 receptor gene (DRD4) variant. This receptor binds both dopamine and norepinephrine and there is a functional polymorphism (variable number tandem repeat—VNTR) in exon III of the gene that has been extensively studied. The seven-repeat allele of this polymorphism has been found to be associated with ADHD in different meta-analyses.16,–,18 The latest meta-analysis shows significant association of small effect size,19 although there is also evidence of substantial heterogeneity across studies. Another dopamine receptor gene, DRD5, has also been consistently implicated. A microsatellite genetic marker located close (18.5 kb) but outside the gene region has also been found to be associated with ADHD in several meta-analyses,19 although again with evidence of moderate heterogeneity across studies. The dopamine transporter gene (DAT1) was originally considered the most likely ADHD candidate gene because it is responsible for the reuptake of dopamine in the presynaptic cleft,20 inhibited by stimulants and also because the DAT1 knockout mouse exhibits hyperactivity and deficits in inhibitory behaviour.21 In the most recent meta-analysis,19 significant evidence of association was found with the 480-bp allele of the most commonly studied polymorphism (a VNTR in the 3′ untranslated region (UTR) region of the gene) as well as with other polymorphisms in the same gene. The substantial heterogeneity reported could be the result of multiple polymorphisms in this gene increasing risk to ADHD or gene–environment interaction between the 3′ UTR VNTR and prenatal factors, such as maternal alcohol consumption22 or maternal smoking during pregnancy,23 although these associations have not been widely replicated. Although these results appear disappointing, it has to be remembered that ADHD GWAS studies are still in their infancy. Apart from sample sizes, which are clearly important, there is the issue of sample heterogeneity, which has also been highlighted by meta-analyses of candidate gene studies19 and can make collaboration and replication of significant results difficult.27 Another view is that disorders such as ADHD and autism may be better explained by the effect of rare genetic variants. Mother's genes can influence ADHD as well as exposure to certain environmental factors. Maternal stress in pregnancy has also been reported to be associated with offspring ADHD symptoms, although recent work suggests that for ADHD (but not antisocial behaviour or anxiety), this might also reflect inherited links between mother and child (gene–environment correlation) rather than being causal.54 In summary, with the exception of the extreme phenotype of foetal alcohol syndrome, the evidence that maternally related cigarette and substance use and stress in pregnancy play a major causal role in ADHD remains equivocal, although many of these factors are clearly detrimental for other offspring outcomes. Most studies, including meta-analyses of premature and/or low birth weight children, find evidence of an association with ADHD (relative risk of 2.64 for ADHD in premature children)55 and ADHD symptoms/attentional problems.56 The risk appears to be strongest for extreme prematurity and very low birth weight in relation to inattention symptoms and ADHD inattentive subtype.57 ,58 Some preliminary studies also suggest the likely importance of intrauterine growth restriction (small for gestational age).59 ,60 However it is not known whether low birth weight and/or prematurity and other associated pre/perinatal risks (see table 3) are risk markers of ADHD or whether they are causal. The findings at least suggest the need for heightened awareness of possible ADHD in very premature/low birth weight children. Associations between organophosphate pesticide exposure and ADHD have been investigated cross-sectionally,62 and prospectively (eg, Eskenazi et al, Marks et al, Rauh et al63,–,65) using assessments of prenatal and postnatal (childhood) urinary organophosphate metabolites and umbilical cord plasma levels of pesticides. PCBs are a large group of toxic manufactured organic compounds that were previously mass produced. Both human and animal studies have examined the effect of PCB exposure on neurobehavioural outcomes similar to those affected in ADHD, and these have found evidence of impairments in working memory, response inhibition and cognitive flexibility.66 A recent prospective study also found a positive association between low-level prenatal PCB exposure and ADHD-type behaviour in middle childhood, with a dose–response relationship.67 Both human and animal studies of lead exposure have shown similar impairments in executive functions and attention, with cognitive flexibility, vigilance and alertness being most reliably affected.66 There is also emerging evidence from several studies that lead could be implicated in ADHD even at low levels, but causality cannot be assumed from the evidence to date. Similarly, further work is needed to draw firm conclusions about how important pesticides and PCBs are as causes of ADHD. Adverse social and family environments such as low parental education, social class, poverty, bullying/peer victimisation, negative parenting, maltreatment and family discord are associated with ADHD. However, the designs used so far have not been able to show that these are definite causes of ADHD. For example, longitudinal and treatment studies suggest that negative mother/son70 and peer relationships arise in response to child ADHD symptoms. This contrasts with findings for child antisocial behaviour/conduct disorder in which a variety of designs including treatment trials have consistently found that adverse social and family environments are causal. However, psychosocial factors might modify ADHD expression especially in those who are genetically susceptible, for example by influencing comorbidities such as conduct disorder, depression symptoms and level of impairment. This needs further investigation. One exception is exposure to extreme early deprivation. A study of Romanian orphans adopted in the UK found a deprivation-specific inattentive and overactive pattern of behaviour.71 It remains to be examined whether a similar pattern of deficits arises in response to less extreme adversity. In summary, there is strong evidence of an inherited contribution to ADHD, although non-inherited factors that likely include environmental risks and chance events (including de novo genetic changes) are also important. There is no single cause of ADHD and the risk factors that have been identified so far appear to be non-specific. That is, risks such as chromosomal microdeletions (eg, VCFS), large, rare CNVs, extreme low birth weight and prematurity appear to affect a range of different neurodevelopmental and psychiatric phenotypes. Genetic risks likely also include multiple common gene variants of small effect size that have yet to be identified, with the possible exception of a few dopaminergic genes. With the costs of DNA sequencing dropping, there is likely to be an increasing focus on identifying rare genetic variants, including structural variants such as CNVs and other rare mutations with larger risk effects. Despite the rapid advances in genetics, there is still a need for further research into environmental risks. Although many factors are associated with ADHD, different designs are needed to test which are causal.45 The strongest evidence relates to the links between ADHD/ADHD-like behaviours and relatively rare extreme adversities, specifically extreme prematurity, very low birth weight, foetal alcohol syndrome and a pattern of behaviours associated with institutional deprivation in the early years. Less is known about risk factors that modify ADHD outcomes. One exception is the association between COMT and antisocial behaviour in ADHD that is well replicated now and highlights that behavioural problems in those with ADHD may have different origins to behavioural problems in general. Cumulatively, the available evidence goes some way towards highlighting groups who are at higher risk; specifically those who have a family history of ADHD and/or neurodevelopmental or learning problems, and those who have been exposed to the environmental adversities described earlier. However, none of these risks, including the genetic ones, provide tests or biomarkers of ADHD. It is hoped that, in the future, improved identification of ADHD risk factors and pathways will increase our understanding of the as yet unknown pathogenesis of ADHD and pave the way for improving diagnosis and treatment. Ongoing ADHD research supported by the Wellcome Trust.
. The mental health of children and adolescents in Great Britain. London: The Stationery Office 2000.
. Young adult follow-up of hyperactive children: antisocial activities and drug use. J Child Psychol Psychiatry 2004;45:195–211.
. Young adult outcome of hyperactive children: adaptive functioning in major life activities. J Am Acad Child Adolesc Psychiatry 2006;45:192–202.
. Gene–environment interplay in attention-deficit hyperactivity disorder and the importance of a developmental perspective. Br J Psychiatry 2007;190:1–3.
. Gene–environment interactions: biologically valid pathway or artifact? Arch Gen Psychiatry 2009;66:1287–9.
. Attention-deficit/hyperactivity disorder: a selective overview. Biol Psychiatry 2005;57:1215–20.
. Genetic basis of attention deficit and hyperactivity. Br J Psychiatry 1999;174:105–11.
. Adoptive and biological families of children and adolescents with ADHD. J Am Acad Child Adolesc Psychiatry 2000;39:1432–7.
. The genetics of autism spectrum disorders and related neuropsychiatric disorders in childhood. Am J Psychiatry 2010;167:1357–63.
. The genetic association between ADHD symptoms and reading difficulties: the role of inattentiveness and IQ. J Abnorm Child Psychol 2010;38:1083–95.
. Co-occurrence of ADHD and low IQ has genetic origins. Am J Med Genet B Neuropsychiatr Genet 2004;124B:41–7.
. Genetic overlap between measures of hyperactivity/inattention and mood in children and adolescents. J Am Acad Child Adolesc Psychiatry 2009;48:1094–101.
. Examining the comorbidity of ADHD-related behaviours and conduct problems using a twin study design. Br J Psychiatry 2001;179:224–9.
. Genetic influences on the development of childhood psychiatric disorders. Psychiatry 2008;7:277–81.
. Meta-analysis of the association between the 7-repeat allele of the dopamine D(4) receptor gene and attention deficit hyperactivity disorder. Am J Psychiatry 2001;158:1052–7.
. Molecular genetics of attention-deficit/hyperactivity disorder. Biol Psychiatry 2005;57:1313–23.
. Meta-analysis shows significant association between dopamine system genes and attention deficit hyperactivity disorder (ADHD). Hum Mol Genet 2006;15:2276–84.
. Candidate gene studies of ADHD: a meta-analytic review. Hum Genet 2009;126:51–90.
. Dopamine genes and attention-deficit hyperactivity disorder: a review. J Psychiatry Neurosci 2003;28:27–38.
. Dopamine transporter mutant mice in experimental neuropharmacology. Naunyn Schmiedebergs Arch Pharmacol 2008;377:301–13.
. A common haplotype of the dopamine transporter gene associated with attention-deficit/hyperactivity disorder and interacting with maternal use of alcohol during pregnancy. Arch Gen Psychiatry 2006;63:74–81.
. Interaction of dopamine transporter genotype with prenatal smoke exposure on ADHD symptoms. J Pediatr 2008;152:263–9.
. Catechol O-methyltransferase gene variant and birth weight predict early-onset antisocial behavior in children with attention-deficit/hyperactivity disorder. Arch Gen Psychiatry 2005;62:1275–8.
. A replicated molecular genetic basis for subtyping antisocial behavior in children with attention-deficit/hyperactivity disorder. Arch Gen Psychiatry 2008;65:203–10.
. Genotype link with extreme antisocial behavior: the contribution of cognitive pathways. Arch Gen Psychiatry 2010;67:1317–23.
. Genome-wide association studies in ADHD. Hum Genet 2009;126:13–50.
. Genome-wide association scan of quantitative traits for attention deficit hyperactivity disorder identifies novel associations and confirms candidate gene associations. Am J Med Genet B Neuropsychiatr Genet 2008;147B:1345–54.
. Molecular genetics of adult ADHD: converging evidence from genome-wide association and extended pedigree linkage studies. J Neural Transm 2008;115:1573–85.
. Family-based genome-wide association scan of attention-deficit/hyperactivity disorder. J Am Acad Child Adolesc Psychiatry 2010;49:898–905.e3.
. Genome-wide association scan of attention deficit hyperactivity disorder. Am J Med Genet B Neuropsychiatr Genet 2008;147B:1337–44.
. Meta-analysis of genome-wide association studies of attention-deficit/hyperactivity disorder. J Am Acad Child Adolesc Psychiatry 2010;49:884–97.
. Cytogenetic abnormalities in attention-deficit/hyperactivity disorder. J Am Acad Child Adolesc Psychiatry 2002;41:806–10.
. Should children with ADHD and normal intelligence be routinely screened for underlying cytogenetic abnormalities? Arch Dis Child 2006;91:860–1.
. Challenges and standards in integrating surveys of structural variation. Nat Genet 2007;39:S7–15.
. Strong association of de novo copy number mutations with autism. Science 2007;316:445–9.
. Rare structural variants in schizophrenia: one disorder, multiple mutations; one mutation, multiple disorders. Trends Genet 2009;25:528–35.
. Rare structural variants found in attention-deficit hyperactivity disorder are preferentially associated with neurodevelopmental genes. Mol Psychiatry 2010;15:637–46.
. Genome-wide copy number variation analysis in attention-deficit/hyperactivity disorder: association with neuropeptide Y gene dosage in an extended pedigree. Mol Psychiatry 2011;16:491–503.
. Rare chromosomal deletions and duplications in attention-deficit hyperactivity disorder: a genome-wide analysis. Lancet 2010;376:1401–8.
. Family adversity in DSM-IV ADHD combined and inattentive subtypes and associated disruptive behavior problems. J Am Acad Child Adolesc Psychiatry 2005;44:690–8.
. Prevalence of attention-deficit/hyperactivity disorder symptoms in 4- to 17-year-old children in the general population. J Abnorm Child Psychol 1999;27:455–62.
. Early head injury and attention deficit hyperactivity disorder: retrospective cohort study. BMJ 2008;337:a1984.
. Time trends in adolescent mental health. J Child Psychol Psychiatry 2004;45:1350–62. , eds. Psychosocial disorders in young people: time trends and their causes. Chichester: John Wiley & Sons 1995.
. Epigenetics and the biological definition of gene x environment interactions. Child Dev 2010;81:41–79.
. Maternal smoking during pregnancy as an environmental risk factor for attention deficit hyperactivity disorder behaviour. A review. Minerva Pediatr 2005;57:359–71.
. 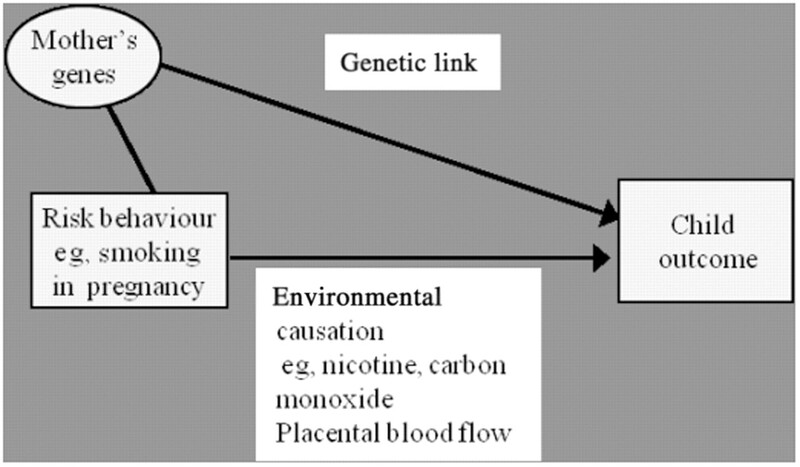 Smoking during pregnancy and offspring externalizing problems: an exploration of genetic and environmental confounds. Dev Psychopathol 2008;20:139–64.
. Prenatal smoking might not cause attention-deficit/hyperactivity disorder: evidence from a novel design. Biol Psychiatry 2009;66:722–7.
. Maternal lifestyle factors in pregnancy risk of attention deficit hyperactivity disorder and associated behaviors: review of the current evidence. Am J Psychiatry 2003;160:1028–40.
. Case–control study of attention-deficit hyperactivity disorder and maternal smoking, alcohol use, and drug use during pregnancy. J Am Acad Child Adolesc Psychiatry 2002;41:378–85.
. The links between prenatal stress and offspring development and psychopathology: disentangling environmental and inherited influences. Psychol Med 2010;40:335–45.
. Cognitive and behavioral outcomes of school-aged children who were born preterm: a meta-analysis. JAMA 2002;288:728–37.
. Meta-analysis of neurobehavioral outcomes in very preterm and/or very low birth weight children. Pediatrics 2009;124:717–28.
. Behavioral outcomes and evidence of psychopathology among very low birth weight infants at age 20 years. Pediatrics 2004;114:932–40.
. Behavioural symptoms of attention deficit/hyperactivity disorder in preterm and term children born small and appropriate for gestational age: a longitudinal study. BMC Pediatr 2010;10:91.
. Small body size at birth and behavioural symptoms of ADHD in children aged five to six years. J Child Psychol Psychiatry 2006;47:1167–74.
. ADHD, lead exposure and prevention: how much lead or how much evidence is needed? Expert Rev Neurother 2008;8:519–21.
. Attention-deficit/hyperactivity disorder and urinary metabolites of organophosphate pesticides. Pediatrics 2010;125:e1270–7.
. Organophosphate pesticide exposure and neurodevelopment in young Mexican-American children. Environ Health Perspect 2007;115:792–8.
. Organophosphate pesticide exposure and attention in young Mexican-American children: the CHAMACOS study. Environ Health Perspect 2010;118:1768–74.
. Impact of prenatal chlorpyrifos exposure on neurodevelopment in the first 3 years of life among inner-city children. Pediatrics 2006;118:e1845–59.
. Lead and PCBs as risk factors for attention deficit/hyperactivity disorder. Environ Health Perspect 2010;118:1654–67.
. Prenatal organochlorine exposure and behaviors associated with attention deficit hyperactivity disorder in school-aged children. Am J Epidemiol 2010;171:593–601.
. Clinical inquiries. Do dietary interventions improve ADHD symptoms in children? J Fam Pract 2010;59:234–5.
. Effects of a restricted elimination diet on the behaviour of children with attention-deficit hyperactivity disorder (INCA study): a randomised controlled trial. Lancet 2011;377:494–503.
. Parent–child relationships and ADHD symptoms: a longitudinal analysis. J Abnorm Child Psychol 2008;36:285–96.
. IV. Developmental course of deprivation-specific psychological patterns: early manifestations, persistence to age 15, and clinical features. Monogr Soc Res Child Dev 2010;75:79–101.